Select which Cube best fits your needs. The legacy Cube is being replaced with the 3rd generation Cube 600 series (which is at a similar price point to the legacy Cube with a lot of added functionality), as well as the most current 4th generation Cube 700 series. The 2nd gen Cube series can accept a maximum of 1080p30 input (either HDMI or HD-SDI input depending on which model encoder is purchased) and stream at up to 10 Mbps over Ethernet with H.264. The 600 series can accept up to 3G-SDI or 1080p60 physical video input on SDI or HDMI connections (both present on the same encoder) and can stream at 1080p30 with H.264 at up to 15 Mbps. 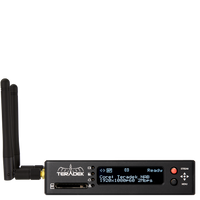 The 700 series can accept up to 3G-SDI or 1080p60 physical video input (both SDI and HDMI present on the same encoder) and can also stream at 1080p60 at up to 30 Mbps, and has both the newer HEVC / H.265 video codec as well as the H.264/AVC codec in the same unit.